A resume is one of the most important documents of your professional career. Simply put, the resume can be described as a brief document that highlights any academic qualifications, professional experience/expertise and any other information regarding the profession and professional life of a person. Writing a resume that effectively summarizes experience, skills and competencies is challenging for many people. A good resume will effectively promote you. 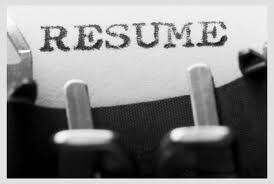 A good resume is piece of paper that takes 10-30 seconds to read and effectively helps you land a job interview. Before diving into the resume writing, let’s focus on the mindset of the hiring managers in order to understand the main features to include in your resume. Working in a company means following a system and being consistently productive. Though this cannot be proven within the first few minutes, your resume can work for you. Your resume is the best weapon you have in your hunt for a job, and a well written one wins half the battle for you. o Equivalents between the job requirements and your qualifications. Employers actually look for similarities between your previous jobs and the new position that they wish to fill. o They wish to see a steady upward curve in your career graph. o Employers want winners. Have you achieved goals? Write about actions you took to achieve goals and the positive results. o Employers would want to observe your competencies. Each job requires a unique set of skills – Behavioral/personal skills and technical skills. · Avoid the one-size-fits-all resume, if you want to take your job search seriously. · Do not use the same resume for every job opportunity out there – It is a strategy that will lead to nowhere. · First and foremost, refer to the section of the job opening where it lists Specification, Job Description, Requirements, or any other selection criteria listed therein. Teamwork: If a job requires experience working in a team, ensure that each of the positions on your resume includes detailed descriptions of your experience working in a team. Managerial positions: If you are aiming for three different positions, such as – project manager, product manager or program manager, these three positions are similar but have different requirements. Therefore, write three versions of resumes showcasing how you meet the job requirements and personality traits needed for each position. · Your key/strongest assets in terms of any employer could be your work history, education, skills and career achievement. · Try to evaluate the key aspect for each job you apply for. Then, make the best case for you background, strengths, education or experience. Grab the attention of the hiring managers by presenting your best arguments in the opening lines of your resume. The three most common resume types are the chronological resume, the functional resume and the combination resume. Ø A chronological resume is best for people who have advanced in their professional life by working in different companies. Ø This type of resume can basically be considered as a time line of a person’s progress from one job position to a superior one. Ø If you have many years of experience, filled different positions and roles within different companies and would want to show a career up-curve, the chronological resume may fit your needs. Ø A functional resume is basically used by a person who has too much experience or too little, or a singular responsibility. Ø A functional resume is basically used by a person who has held a number of job-positions in a single or very few companies. Ø If you have just started out, do not have much experience and are aiming for entry level jobs, the functional resume would suit your needs. Ø A combination resume is actually a good combination of the chronological resume and the functional resume. Ø The combination resume makes a note of your work history, as well as giving special attention to your qualities and qualifications on a professional level. Ø If you haven’t changed too many jobs but filled many roles within a certain company, the functional resume or combination resume would be perfect for you. Realize that you will have to create multiple resumes. Since the point of targeting is to create a specific resume for a specific job, you may find that writing and revising multiple resumes is time consuming. Describe you major professional skills and expertise with No. of years of experience. Focus your statement on the position you’re aiming for. Hint about your advantages and the benefits you’d bring to the position. Use action verbs as an active, expressive way to describe your achievements. List major achievements per job and also include professional knowledge developed or promotions/appraisals you’ve received. Highlight technical skills that you have through experience. You can also consider including your key personal skills that can make you an attractive candidate. Use keywords to detail these skills. Related Competencies that you feel are important to the position you are seeking – General personal skills, computer skills and/or technological skills. List educational degrees and institutions you’ve graduated from. List related professional courses and certifications received that are relevant to the targeted position. Consider including 3 names and contact details of references. Make a list of the requirements per each job posting for which you are going to send your resume – Skills, education/qualifications and job description. You will need this information for targeting your resume to this particular job. What is a good Career Objective to put on a Resume? Everyone knows the standard resume needs a career objective. But why? Is it because everyone assumes you have to have one? Is it because hiring managers require it? What would happen if you had the most comprehensive and impressive career objective that others were measured against? 2. A set of words that have no tie to the candidate`s wants, needs or desires for their future. Companies need to fill positions within their organization with the best qualified individual(s). Hiring managers will review hundreds of resumes with the first 30 seconds being crucial to getting to the second stage. Your career objective is a one sentence character representation of who you are and sets the stage for the message you want to deliver. - "This is who I am, who I want to be and how I will make your company successful"
Your background could be one of your best assets. The work experience is one of the first things that employers look for. They would want to assess your work history (i.e. background) as the first aspect about you as a potential employee. Employers do not like reading those long lists of job duties/responsibilities. They are actually interested in the main/major accomplishments and responsibilities per job title – no more. List your previous jobs in reverse order – the most recent first. You don’t have to specify months per employer timeline – years are ok. Gaps: As a rule of thumb, if you have more than one year of an employment gap for any reason, do not leave these years blank – It will be noticed and considered as a negative point about you. Dates: Employers are interested in reading about the years of work history that are relevant and related to the position you are applying for. It is okay to specify any relevant background as long as it provides significant information regarding your skills and ability to do the job. What person would you choose if you were an employer? A person with past record, achievements, who accomplished something in career or someone who fulfilled duties, tasks and “was responsible for” – You will undoubtedly prefer a result oriented person. If you write in term of achievements you prove in the most effective way that you have the required competencies, you are motivated, self-aware and that you’re a performer. What else do you need to communicate to the reader? An organizational problem that you solved. Any initiative that led to constant benefits, high revenues or improved quality. Any positive difference that you have made in sales numbers, costs and profits? Any successful project that increased the company’s reputation. Saved $15 million annually by reducing fixed spending by 10% and variable overhead spending by 19% through a variety of cost-improvement initiatives through better utilization of resources. · Developed and implemented client service program, which expanded small-to-medium client base by 35%. * Content skill is the amount of knowledge (qualifications and experience) the candidate possesses in a certain field. * Functional Skills are people-oriented skills such as communicating, organizing and managing. * Self Management Skills are your personal characteristics such as helper, self-learner, multi-tasker etc. Based on the job description, you can include a skills section in your resume to specify your personal and/or technical skills. This particular candidate is a software engineer (see how many industrial keywords are written here). Your education is definitely one of your biggest assets. Use your education in your resume with care. It can be an essential element that can lead you to be called for the job interview. In general, educational information follows the job experience section or the key skills section in a resume – towards the end of your resume. However, the place where you insert the information about your education depends on your work experience. If you have just graduated and/or don’t have many years of experience, your greatest asset is obviously your education – not your experience. Therefore, in this case, put the education section before your work history section. 1. If you have a solid work experience, list it first in your resume. 2. If your education is a stronger asset than your job experience, list it first. 3. If your education is highly relevant to your new position, you may consider listing it first. 4. If you have no employment experience, but have a degree or training in that field, list your education first. You may consider including any coursework, related training, or certifications you have received. If you received licenses, include the name/type of the license. You can also include a separate section called “Training & Certification”, “Special Training”, or “Professional Licenses”, etc. If you have achieved honors, make sure to include it. Significant Coursework (optional, only if you find it important): [a], [b], [c] etc. The resume consists of various sections/paragraphs in which you can highlight your background and skills. You must select or invent headings that show you in the best possible light and are relevant to the job for which you are applying – one usually puts the most recent or impressive information first.